Keep your hot water heater from flooding your basement. Conventional water heaters have always bothered me. Why would anyone install an appliance that is guaranteed to fill your basement with water the moment its warranty expires? The age of the conventional water heater may be ending. I’m happy to see many more Indirect Hot Water Heaters and more Demand (tankless or instantaneous) water heaters installed in existing houses, but I also see many new conventional water heaters installed, too. Most hot water systems are installed on an emergency basis, after the old one has failed, and homeowners and and plumbers don’t put much thought into doing anything except replacing what’s currently there. It’s also a pricey repair, and not many people are thinking about investing in the future, when the new system will fail 7-10 years hence. Over the years, I’ve considered prophylactic non-emergency hot water heater replacement, but somehow never got around to that before the tank failed. It’s a good idea if you can do it. 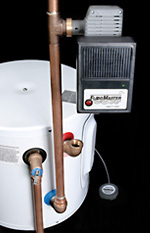 Plumbers charge much less when installing hot water heaters on a pre-need basis. I’ve tried monitoring for rusty hot water, a sign that a hot-water heater is nearing the end of its life and entering its incontinent phase, but to no avail. As much as I try to outsmart these devices, every few years I”m greeted by a basement full of warm water and an urge to call a plumber. You can buy a simple moisture alarm that costs about $15 that will make noise when the floor around the tank gets wet, but what good is that if you’re not home? If you must have a conventional water heater, there are now better solutions to the wet basement problem. Most cost substantially less than the cost of cleaning up a flood. I have yet to see one of these installed in a house. I think most homeowners and plumbers unaware of it, but I’m hoping that will change soon. One solution is so simple, I’m surprised it’s not standard on all hot water heaters. A moisture sensor coupled with a water intake shutoff valve. 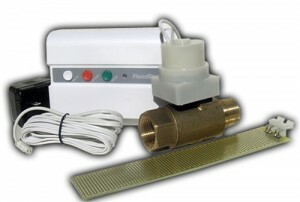 One of of these floodproofing systems is The Floodmaster FM-094 Hot Water Heater Feed Water Alarm/Shut-Off – this sells for about $200. This one appears easier to install and sells for around $125. As for me, when I had my new heating system installed, I had it plumbed for an indirect hot water heater. The next conventional hot water heater that breaks in my house will be the last one. for a while and yours is the best I’ve found out so far. Floodmaster devices are almost $300 at Home Depot right now. You might do better by shopping around. A plumber also needs to install it on your supply line. This is pretty simple and should not cost all that much, if you do it when the plumber has another reason to come to your house. 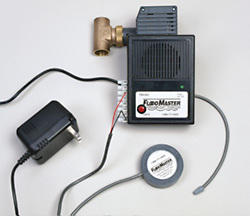 You also need to plug in the Floodmaster, so if there are no outlets near, that could add to the expense. Here’s a site that explains how these are installed.